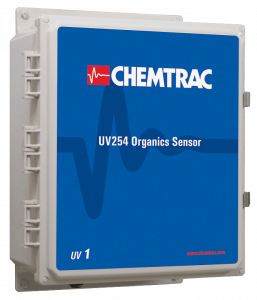 UV254 Organics Monitor UV1 | Chemtrac, Inc. The UV1 Organics Sensor, when combined with a HydroACT analyzer, provides online continuous organics monitoring utilizing a 254 nm ultraviolet light source. The amount of light absorbed provides an ongoing indication of natural organic matter (NOM) in a flowing sample, and serves as a continuous surrogate measurement for total organic carbon (TOC). The patent pending Ortho-Beam technology provides many significant advantages while maintaining affordability. The sensor’s unique ability to automatically detect and compensate for UV lamp fluctuations and quartz fouling, minimizes losses in accuracy over time and reduces maintenance. The UV1 Organics Sensor, when combined with a HydroACT analyzer, provides online continuous organics monitoring utilizing a 254 nm ultraviolet light source. The amount of light absorbed provides an ongoing indication of natural organic matter (NOM) in a flowing sample, and serves as a continuous surrogate measurement for total organic carbon (TOC). More specifically, UV254 is the best detector of aromatic or reactive organics, which when combined with chlorine, can form disinfection byproducts (DBPs). The patent pending Ortho-Beam technology provides many significant advantages while maintaining affordability. The sensor’s unique ability to automatically detect and compensate for UV lamp fluctuations and quartz fouling, minimizes losses in accuracy over time, and significantly reduces maintenance. Combine with other HydroACT sensors like SCM, NTU, Chlorine, etc. Flow Rate 300 – 1000 mL/min. For over 25 years Chemtrac has exhibited at the AWWA Annual Conference & Exhibition. This week, at ACE15 in Anaheim, they are introducing the next generation Laboratory Charge Analyzer (LCA), along with the new and improved Benchtop/Portable Particle Counter (PC5000). Attendees of the Alabama Rural Water Association’s Annual Technical Training Conference were able to learn of the advantages of streaming current monitoring while visiting the Chemtrac booth. 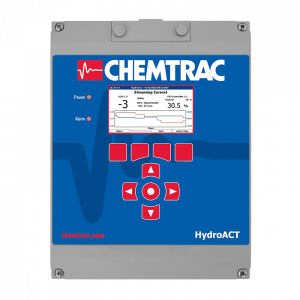 At the Georgia Association of Water Professionals (GAWP) Annual Conference & Expo in Savannah, GA, July 20 -22, Chemtrac will exhibit a new line of automatic controllers for optimizing coagulation and filtration. What is the UV254 water quality test parameter? 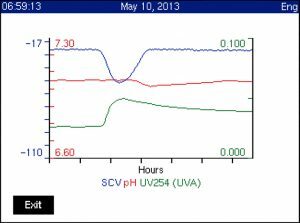 UV254, also known as the Spectral Absorption Coefficient (SAC), is a water quality test parameter which utilizes light at the UV 254nm wavelength to be able to detect organic matter in water and wastewater. This is due to the fact that most organic compounds absorb light at the UV 254nm wavelength. Unlike other organic test parameters, UV254 has a bias towards reactive or aromatic organic matter which has double bonded ring structures and is typically the most problematic form of organics in water. UV254 is typically represented as a calculation of UV absorbance (UVA) or UV transmittance (UVT). UVT is a relative measurement. It is essentially a measure of how much light passes through a water sample compared with how much light passes through a pure water sample. The sample water measurement is actually divided by the pure water measurement and then converted to a percentage. Therefore, any unit of measure of the light itself is cancelled in the division. An example of a UVT measurement would be 96.4% UVT. Pure water (DI water) will read 100% UVT, and completely opaque water will read 0% UVT. Typically UVT is only used to refer to the transmittance of light at the 254nm wavelength since its application is usually for UV disinfection system dosing. UVT will be different for different path lengths. Because the UVT varies with path length and the concentration of matter, the UVT is usually expressed with the assumption that a 1 cm path length is used so that the UVT provides a measure of matter in the water independent of path length.